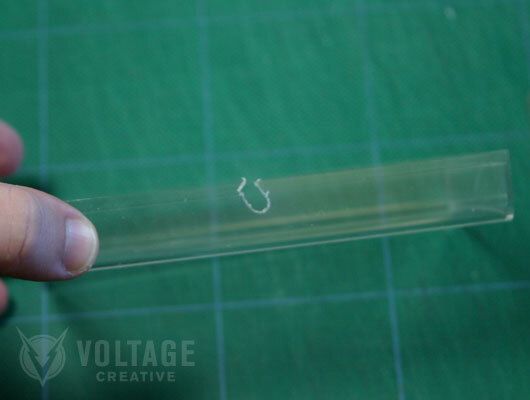 Before we go any further, here’s the disclaimer: This DIY project uses many sharp and otherwise hazardous tools, as well as some rather expensive hardware. Be careful. If you break your iPod or hurt yourself doing this, I’ll not be held responsible as I’ve made no warranties regarding the soundness of these instructions. Proceed at your own risk. This isn’t really a lightweight DIY. I used a lot of tools. Dremel Tool with cutting, grinding, and polishing disks. Hand held course round file. Hand held fine triangle file. 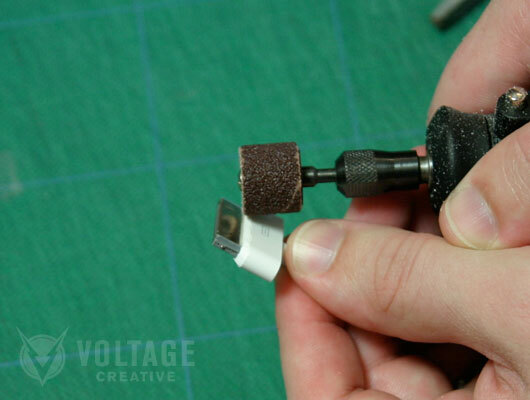 Power Drill with 3/16″ and 1/2″ bits. 1.) The first order of business is to get rid of two little tabs on the underside of the front lip of the dock insert. 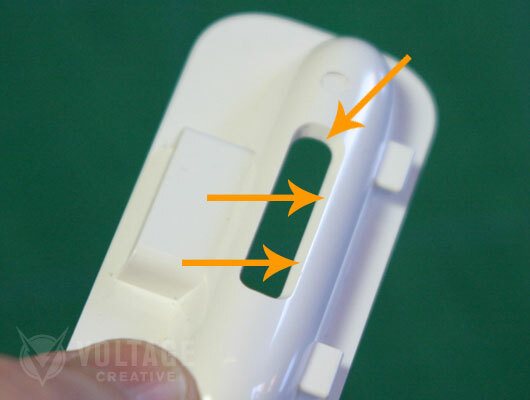 Removing these allows the insert to sit flat on top of the iPod / iPhone box lid. NOT the horizontal tabs in this photo, leave those. 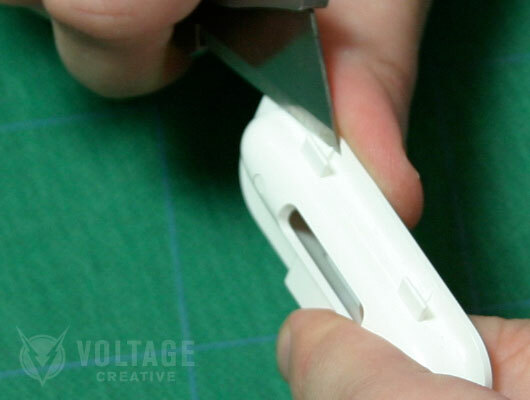 The ones we’re cutting are the tiny little tabs directly on the underside of the dock insert lip. These are right at the tips of the orange arrows in this pic. 1.1) I used a simple box knife for this. The insert is soft plastic and these come off easily. Just shave them down until they’re flush with the lip around the top of the dock insert. Set the insert aside once you’re done with this. 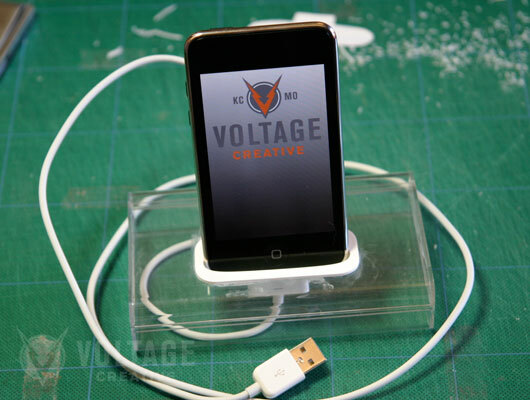 2) Print the dock insert template (Download the template here. PDF ~1.5mb) and cut one out. The print out has more templates than you’ll need, but since your printing an 8.5×11 sheet, I figured, “Why not?” We’ll use this template as a guide for cutting the hole in the lid of our iPod box. 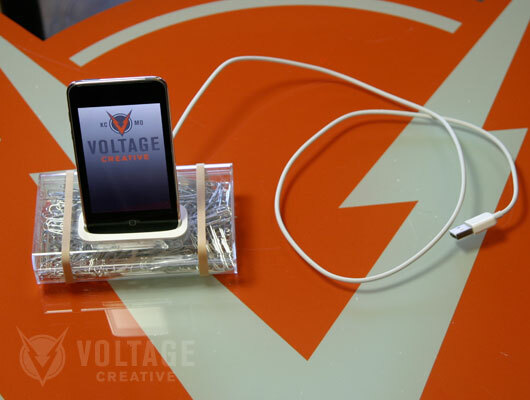 This will allow the bottom of dock insert to sit down in the box through the lid with the lip sitting on top of the box supporting the iPod / iPhone and giving us a nice gluing surface. 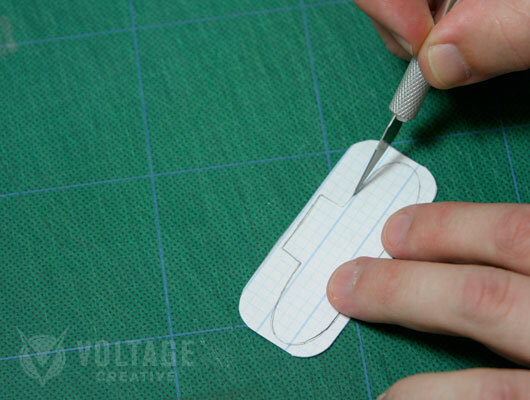 2.1) Cut the middle out of the template pattern and affix the surrounding material to the top of your box lid. (Take care on the alignment.) Use your sharpie to make a series of dots just inside the template. We’ll use these dots as a guide when we start removing material from the lid. 2.2) I’ve highlighted the dots on my lid in this picture. This is what it should look like when you take the template off. 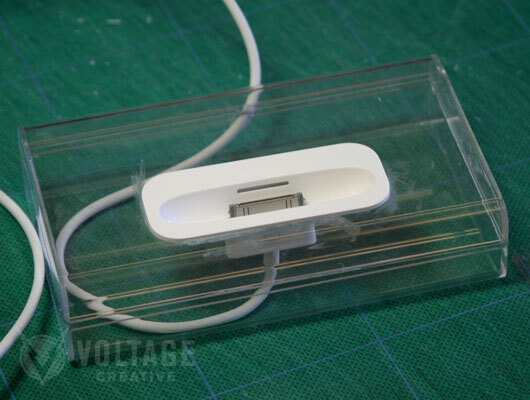 The dock insert template can now be discarded. 3) I used a large drill bit to get the party started on removing material from my lid. Caution: this box is made of HARD plastic. 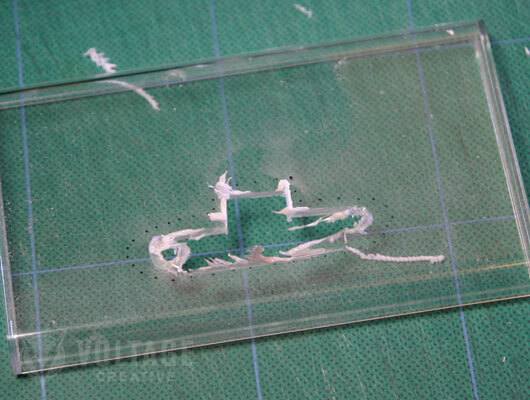 It does not like being cut, drilled or otherwise modified. Hang on tight to the lid and be careful. 3.1) Using a combination of drilling and dremel, we’re off to an ugly start. The end goal here is to remove material from your lid just until you reach the point that there are no more dots. 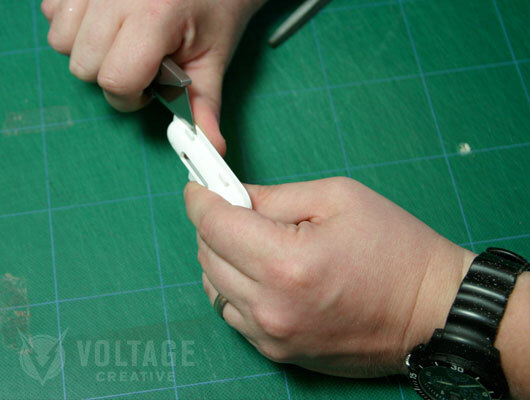 Then you alternate test-setting the dock insert down in your box and removing more material until you have a good fit. This is the longest part of the project, it probably accounted for more than 60% of the time I spent on this. 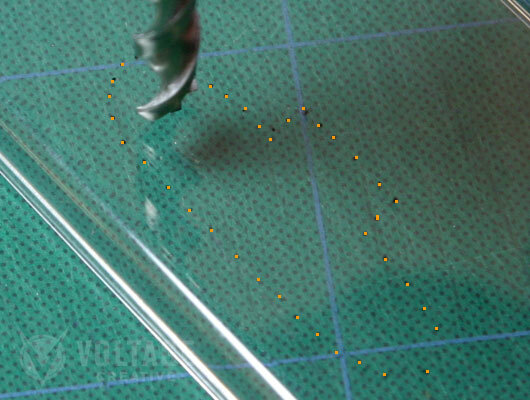 3.2) As I got very close to the dots I switched over to the hand files and started doing test fittings. 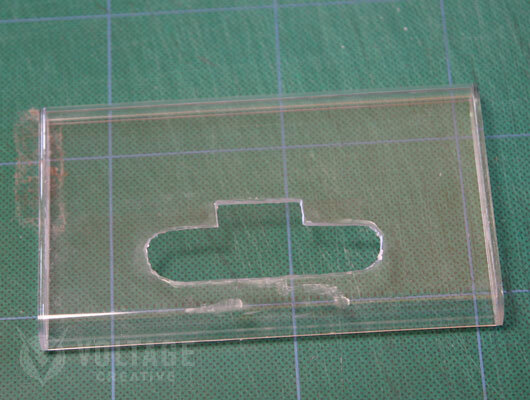 You want the dock insert to be snug in the cutout you’re making. 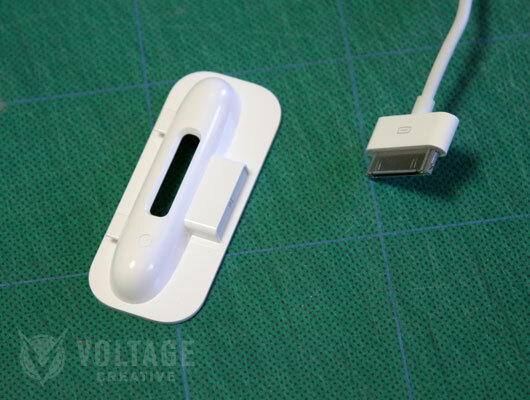 This will make your dock’s top more robust as well as better looking: the dock insert has a fairly wide lip around the top that will support the device itself as well as cover up our ugly edges. 3.3) This is my finished cutout for the dock insert. The last thing I used was a cotton polishing wheel on my Dremel. 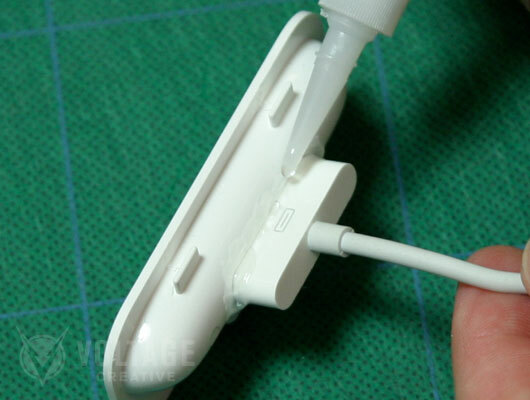 Having a super smooth surface helps your superglue stick. You’ll notice some rough spots far from the hole on the front edge. 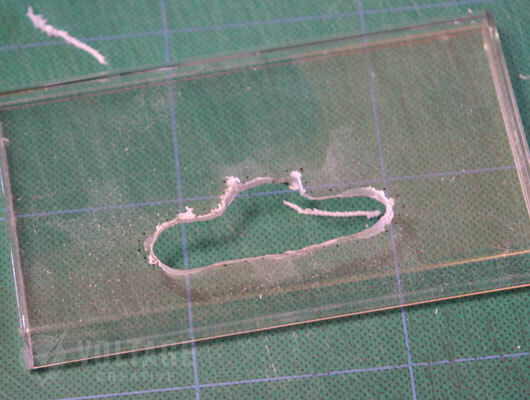 These were made by the chuck of the Dremel tool as I was using it to clear away material inside the cutout. Be careful. Once you’re at this point, set the lid aside. 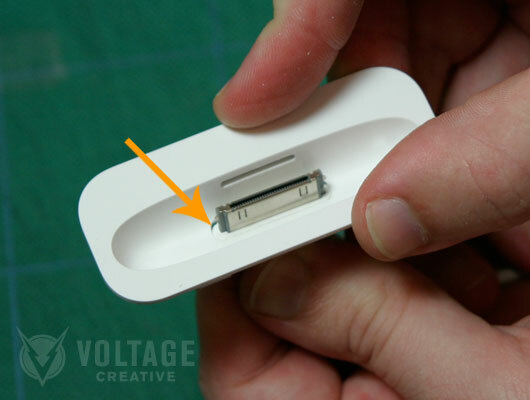 4.1) You’ll notice the hole in the bottom of the dock insert has beveled edges. 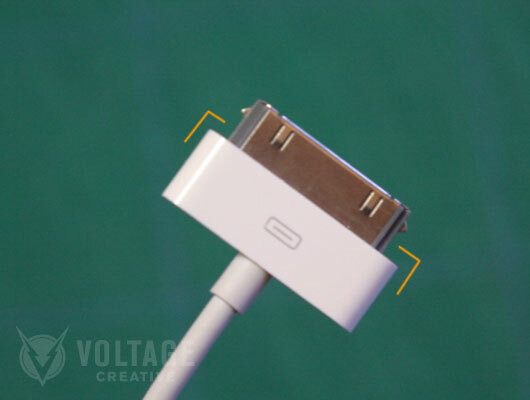 4.2) You’ll notice your USB connector does not. 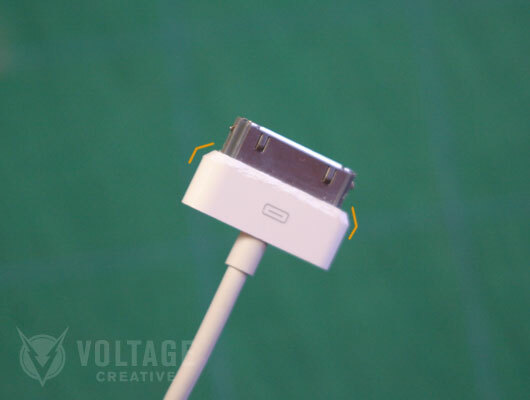 4.4) Grind down the edges of the top of your iPod USB connector until they match the bevel of the hole in the dock insert. This is another point at which you must be very careful. You don’t want to eat into the metal and bork the whole connector. 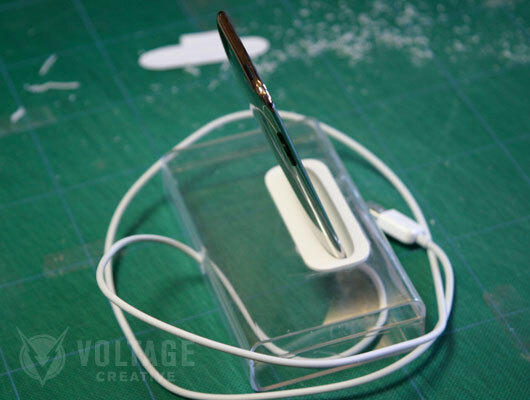 Just bevel the plastic edge around the top. 5) Glue these together and set aside to cure. (This is a picture of me using way too much superglue.) 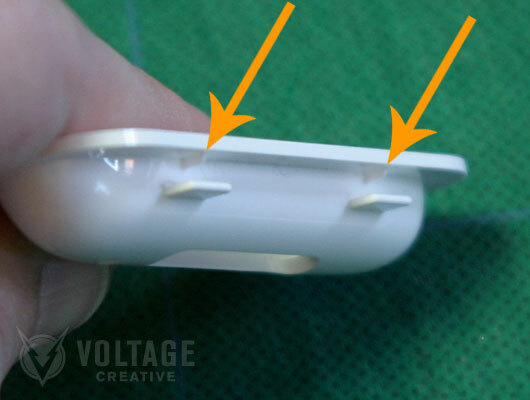 You’ll want to check-yourself before you wreck-yourself using this glue around electronics: it does freaky things to plastic, so keep it away from your iPod Touch’s / iPhone’s internals where it snaps onto this connector. At least until well after it has fully cured. 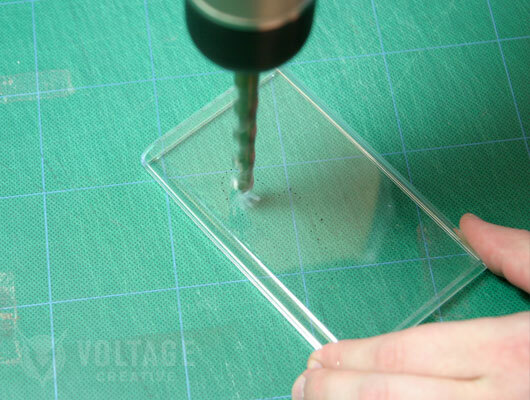 6) Using the 3/16″ drill bit, drill a hole on the back of the bottom piece of your plastic box and then work that into a slot for your cord pass through. 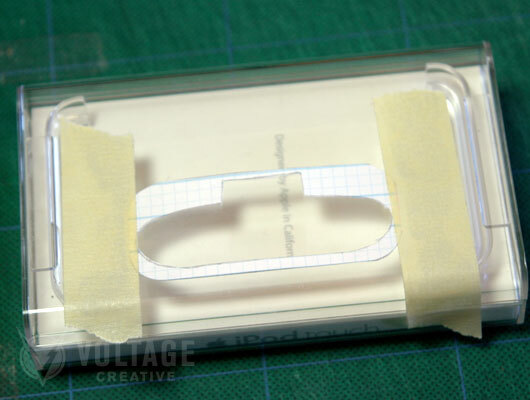 7) Now, we just need to glue the insert into the actual top of the box, which is very straightforward. 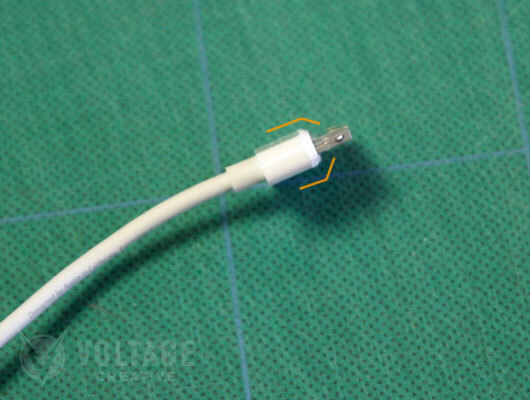 Thread the cord into our pass through in the back and put the bottom & top back together. 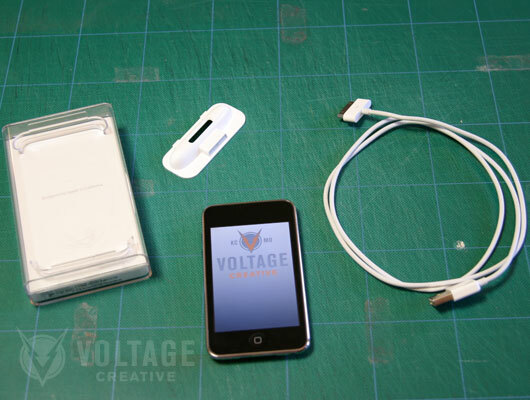 These steps should be completed after your iPod Touch / iPhone 3Gconnector and dock insert have had plenty of time to set up. Just follow the instructions on your glue tube. 8) I added two rubber bands to function like rubber feet. These really stick it to the desk. 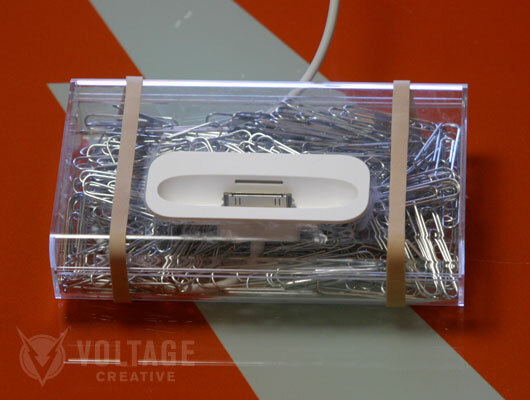 I also threw some paper clips in the bottom. This adds weight, which isn’t really necessary, but it also went a long way towards making those ugly scrapes I made with my Dremel chuck in step 3.3 a lot less noticeable. 9) Ta-daaa! 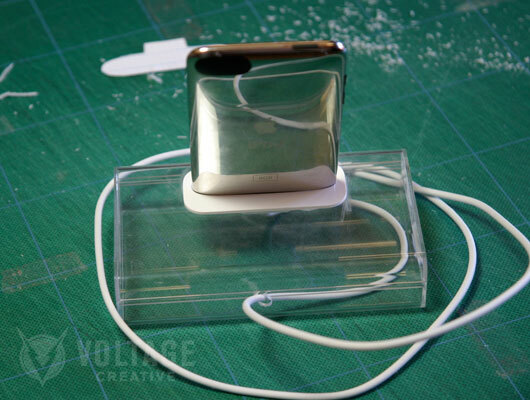 Your very own iPod Touch / iPhone 3G dock. Enjoy.